Theater Arts, which celebrated its 143rd anniversary season last year, continues to be one of the school's largest student co-curricular activities with the annual production of a dramatic production in the fall semester involving over 40 students and a full-scale musical play in the spring semester involving over 100 students. Students receive Performing Arts credits for their work (approved by the University of California and the State College System). Any student may take the Drama IA and Drama IB courses. The courses review the basic skills of the creative process of acting, characterization, movement, play writing, and staging. Students also study play production and technical theater information, as well as an overview of theater history. These classes offer their scenes and projects for an audience of students, parents and friends. Students are required to see two live theatrical productions and evaluate the acting/play writing/production values of these works to reinforce their classroom experiences. Many students who first act in these classes go on to audition for the school's productions (Drama IC), and some have elected to continue their studies in theater arts on the collegiate level. 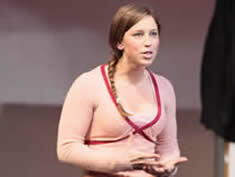 Course Description:In Acting 1A students will explore various approaches to characterization. Students will also master an overview of the major historical periods of theatre history from Ancient Greece to the 19th Century. Using sequentially structured activities developed by Stanislavski, Michael Checkov, Uta Hagen, Stella Adler, Viola Spolin, Sandy Meisner and Keith Johnstone, students will develop an approach to enact short scripted and non-scripted monologues. Students will be introduced to the performing and fine art resources that both our neighborhood and our school have to offer. Course Description: In Acting 1B Students will continue the study and development of acting through scene work. While building on the principles and techniques learned in Acting 1A, students will participate in group warm-ups (vocal and physical), theatre games, improvisations, and advanced theatre exercises. Students will work on scenes from professionally produced plays. Students will study and write a paper on a particular playwright of the 20th Century. Students will also give a presentation about this playwright as well as perform a scene from the playwright’s works. 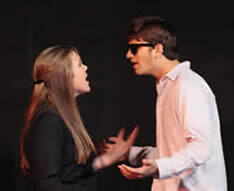 Students will also attend a professional theatre production and productions here at St. Ignatius. Course Description: In Advanced Acting 1C: Fall Play, students will have the opportunity to delve deeper into the craft and discipline of acting. While building on the principles and techniques learned in Acting 1A and Acting 1B by working on a full length production from a professionally produced play. Students will be hands on throughout the entire rehearsal process starting with the read through and character development to the final technical and dress rehearsals. This class culminates in an actual performance in front of a live audience. Course Description: In Advanced Acting 1C: Spring Musical, students will have the opportunity to delve deeper into the craft and discipline of acting. While building on the principles and techniques learned in Acting 1A and Acting 1B by working on a full length production from a professionally produced musical. Students will be hands on throughout the entire rehearsal process starting with the read through and character development, music and dance rehearsals to the final technical and dress rehearsals. This class culminates in an actual performance in front of a live audience. This production is a co-curricular activity. Advance Drama students work with our drama director learning the art of directing and then direct newer drama students in short scenes. Each year the festival celebrates the work of one 20th century playwright. This is a perfect activity for newer actors giving them a chance to learn the process of a theatre production. This activity will culminate in a production with lights and costumes performed in front of a theatre audience. This production is a co-curricular activity. Newer musical Theatre students work with a professional director/choreographer learning the art of musical theatre. They rehearse and perform solos as well as small group numbers. This is a perfect activity for newer performer giving them a chance to learn the process of a theatre production. This activity will culminate in a production with lights and costumes performed in front of a theatre audience.